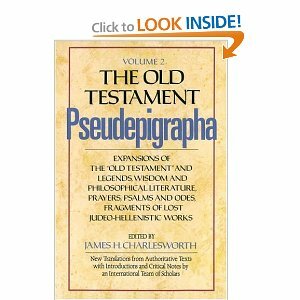 I just received Charlesworth's The Old Testament Pseudepigrapha, Vol. 2. I know, I know. As a scholar of early christianity(ies) I should have owned this book long ago, but I never could bring myself to purchase it for the prices I found. Plus, I could get access to almost all of the texts it contains other (free) ways. Well, I recently received some Amazon $ and found a used hardcover copy on a good sale, so I bit the bullet. Now, I can simply spin around in my desk chair and pull this tome off the shelf anytime I need to reference expansions of the "Old Testament," legends, wisdom and philosophical literature, prayers, psalms, odes, or fragments of lost judeo-hellenistic works.